The competition, which will recognise the talents of the brightest electrical students in the UK, is open to all level 3 students. Each entrant will be asked to take part in a series of different challenges with the final eight contestants taking part in a Grand Final at partner sponsor Click Scolmore’s headquarters in Tamworth. ‘Apprentices are the lifeblood of our industry and NICEIC and ELECSA are committed to developing the talent of the future,’ said senior marketing manager, Julie Blake. Kicking off in December the competition is split into different stages. The first stage will be an online exam throughout December and January 2016 comprising of a variety of questions relating to electrical installations. The top 20 per cent performing students from that stage will then go on to the second stage of the contest in March 2016 – a practical 1½ hour exam held at one of seven locations across the UK. The practical sessions will be marked by NICEIC and ELECSA’s Tony Cable and Darren Staniforth with the top eight making it through to the Grand Final which will take place in the summer of 2016. The eventual winner will rceive a £2000 holiday voucher which can be spent on a trip of their choice. There is a £500 holiday voucher for the runner up and each finalist will also receive an iPad. Every college that enters more than 20 students will also be sent a special goody pack of materials kindly provided by Click Scolmore. 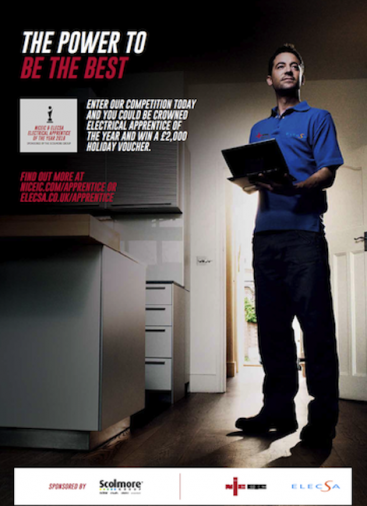 To take part visit www.niceic.com/apprentice or www.elecsa.co.uk/apprentice and register your details now.